Original NASA astronaut Scott Carpenter, as seen in 1962 wearing his Mercury spacesuit, died Oct. 10, 2013. Carpenter was commissioned in the U.S. Navy in 1949 after being trained in aeronautical engineering at the University of Colorado, according to NASA. He flew in the Korean War, attended the Navy Test Pilot School at Patuxent River, Maryland, and subsequently tested multiple types of navy aircraft. Just before joining NASA, Carpenter was an air intelligence officer aboard the USS Hornet aircraft carrier. When Carpenter joined NASA in 1959, he and his six fellow astronauts became famous overnight. The United States and the Soviet Union were engaged in a "space race" to demonstrate technical prowess, and were racking up human spaceflight milestones as quickly as possible. Carpenter was assigned to communication and navigation responsibilities for the Mercury program on top of his spaceflight training. 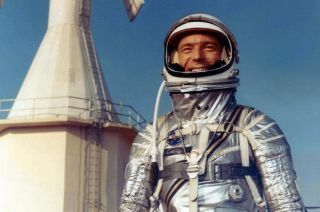 Carpenter was selected for the second orbital flight of the Mercury program, whose goal was to prove that humans could work effectively in space for up to a day at a time. In February 1962, John Glenn performed the first Mercury orbital mission (at three orbits) and received worldwide acclaim for the feat. Carpenter, who was backup for the flight, also served as the capsule communicator when Glenn was in orbit. Just as Glenn began his trip into orbit, Carpenter radioed the words, "Godspeed, John Glenn." That phrase became one of the most famous quotes from the Mercury program, and was used again when Glenn returned to space aboard shuttle mission STS-95 in 1998. Carpenter's flight followed just a few months later, on May 24, 1962. Like Glenn before him, Carpenter made three turns around Earth and spent four hours 54 minutes in flight, but he overshot the landing target by about 250 miles (400 km). Recovery forces took nearly an hour to get to him, but Carpenter waited safely in a life raft until they arrived. Some officials within NASA attributed Carpenter's overshoot to inattention. Chris Kraft wrote in his autobiography "Flight: My Life In Mission Control" that Carpenter was more focused on the view than keeping the mission together. The astronaut countered in a 1998 oral interview, however, that there were several contributors. The yaw sensor was faulty (which meant the spacecraft was out of alignment), he had to do retrofire manually because the gyros "were not indicating properly" and the thrusters were not thrusting as much as they were supposed to. He did, however, also blame himself in part. "I managed my fuel supply badly on the second orbit over Australia," he recalled. "There was excessive fuel use, which scared a lot of the folks on the ground. There was enough. There was enough for the entry. A lot of people thought there would not be. And it was anybody's guess." Astronaut M. Scott Carpenter, prime pilot for the Mercury-Atlas 7 (MA-7) mission, talks with President John F. Kennedy via radio-telephone from aboard the carrier U.S.S. Intrepid. Carpenter was recovered by a helicopter and taken to the U.S.S. Intrepid after a 4 hour and 56 minute mission in space. After returning to Earth, Carpenter took a leave of absence from NASA to become an aquanaut. Specifically, he joined the Navy’s Man-in-the-Sea Project's Sealab II project and in 1965, spent 30 days living underwater in the waters near La Jolla, Calif., at about 205 feet (63 meters) below the surface, according to a NASA biography. Carpenter put this training to good use upon returning to NASA, where he designed underwater spacewalk or extravehicular training. He also assisted with the design of the lunar module, the spacecraft that eventually landed on the moon during the Apollo years. Carpenter then rejoined the Navy as director of aquanaut operations for Sealab III in 1967. "There are many, many similarities in the training and in the environment [of], quote, 'isolation and confinement,'" Carpenter said in 1999, comparing the sea and space environments. "And the people — the people are similar. Although Navy and civilian deep-sea divers are not as highly educated by and large as the heroic spacemen are, they are the greatest bunch of unsung heroes I’ve ever known." Carpenter retired from the Navy in 1969 to do multiple business ventures related to underwater activities. He consulted with sport and diving equipment manufacturers for "design improvements" to multiple types of diving equipment, according to NASA. Carpenter wrote two novels that he called "underwater techno-thrillers" (in addition to his autobiography, "For Spacious Skies"). Carpenter died on Oct. 10, 2013, after a stroke, at the age of 88.